Since the initial drafting of this piece, Liberation Tigers of Tamil Eelam (LTTE) leader Velupillai Prabhakaran allegedly has been killed by the Sri Lankan forces and the Tigers have surrendered. According to Sri Lankan President Mahinda Rajapaksa this victory in his military campaign against the LTTE has ushered in an era of peace on the island. Thus, the demands we made below for a ceasefire may now appear moot. 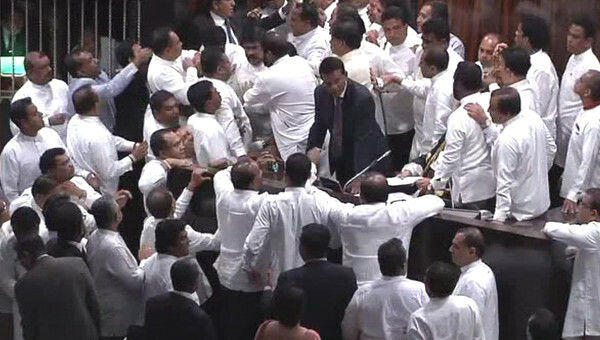 However, because of the Sri Lankan government’s continued refusal to address the structural problems that led to Tamil discontent in the first place and its refusal to acknowledge the horrific manner by which it killed thousands of Tamil civilians in the Vanni in just this latest round of war, there is enough reason to believe that violence will flare up again in the country, perhaps sooner rather than later. Any peace that does not recognise its own limitations will be shortlived. For this reason, despite the ending of Eelam War IV, it is still necessary that we work toward more humane alternatives, involving strategies to push the Sri Lankan state into a political resettlement. 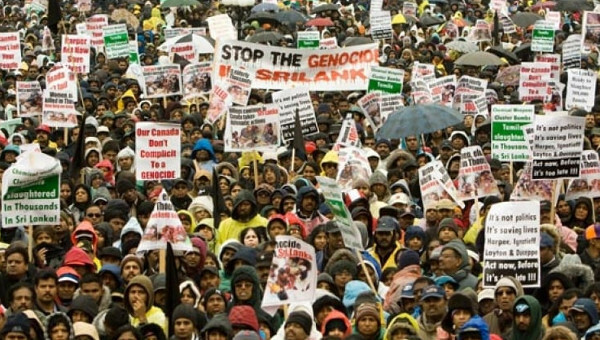 The recent burst of mass mobilizations by sections of the Tamil-Canadian community in Toronto (and to varying degrees across Canada and North America) has brought to the fore several contradictions concerning the conflict in Sri Lanka and its presence in and connection to Canada. Mainstream media’s responses to the protests have been overwhelmingly racialist, exposing many of the limits of Canadian multiculturalism. In order for Canadian multiculturalism to accept any given group of people as a cultural community, it must define that group by differentiating it from a supposedly mainstream Canadian identity. This focalising Canadian identity – in effect a non-identity – is white and middle-class. Thus, when the Toronto Star publishes an editorial entitled “Protesters vs. the public” it effectively notes that the protesters are not part of the public by pitting (Tamil) protesters against the (Canadian) public. Rather than focusing on the war, media outlets have focused on the inconvenience posed to commuters, thereby shifting attention away from deaths in Sri Lanka to traffic regulations in Canada. Consequently, responses to the protests have largely demonstrated pernicious xenophobia. For instance, in the Toronto Sun , Peter Worthington argues that not using excessive force (e.g., water cannons) against Tamil protesters who block streets is tantamount to “reverse racism” against white Canadians. 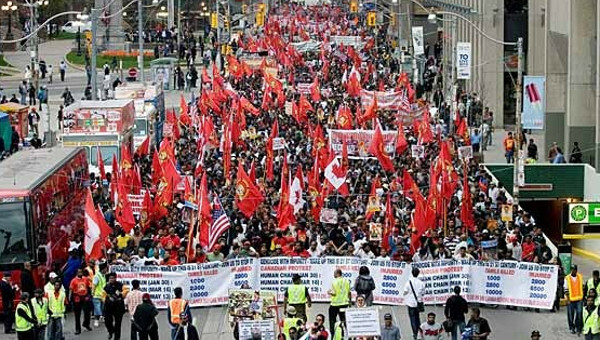 The responses of politicians and police officials who addressed themselves to “the Tamil community” falsely suggest that all the protesters were Tamil and that all of Toronto’s Tamils supported the protests. The paternalism of Mayor David Miller’s deciding to tell “the Tamil community” what it “needs to hear from us” (whoever “us” is) feeds into the blatant racism expressed by other elements of the public. Thus, for instance, in The Globe & Mail Christie Blatchford uses the demonstrations to question not just protest tactics, but also the immigration policies that, according to her, have led to the presence of a worryingly large number of Tamils in Toronto. Parallel to Miller’s homogenization, though coming from the opposite direction, veteran dissident leftist Judy Rebick notes on her blog that, “in a brilliant action, the Tamil community […] climbed the on ramp on to the Gardiner Expressway […] and sat down blockading traffic for several hours.” While the action, as an object lesson in activist tactics, was brilliant, one can say with certainty that “the Tamil community” neither climbed onto nor sat down on the Gardiner. Rather, a more correct terminology would be what Rebick subsequently calls “a group of Tamil activists.” The tenor of her blog post, however, confirms that she views the Tamil community in homogenous terms. She goes so far as to end her post with the note that “we are all Tamils,” a statement that is problematic on two grounds. First, working in solidarity with others requires acknowledging the lived differences that separate us so that we might use those differences for the purposes of justice, rather than discounting them out of an unhelpfully over-forced empathy. Second, that kind of statement presupposes that there is only one kind of Tamil identity, which everyone else can access. Yet if Tamilness is an identity constructed solely on the basis of one’s presence at or support for the protests, not even all Tamils can be called such. If Toronto’s Tamil population is being flattened into one homogenized entity by politicians and many leftist activists, that process is certainly not being opposed by some sections of Toronto’s Tamil community. The Canadian Tamil Congress (CTC), one of Toronto’s more prominent Tamil political groups, notes that it is “the unified voice of Canada’s 300,000 Tamils.” Its FAQ page shows that it ascribes to all Sri Lankan Tamils the desire for a separate homeland (Tamil Eelam). The history and current reality of a diversity of non-communal and Tamil organizations and individuals within and without Sri Lanka, with varying goals and political objectives – and varying definitions of self-determination for Tamil people – is elided by this construction of Tamil identity. It is impossible for the CTC to be the unified voice of Tamils when Tamils don’t have a unified voice. In other words, to return to Rebick’s rallying cry, we are not all Tamil, if only because there is no one Tamil identity we can be. To signal toward complexity and difference within Tamil communities is not to deny the Sinhala ethnic chauvinism of the government of Sri Lanka; its use of undemocratic and authoritarian practices to crush dissent; or its use of mass murder, ethnic cleansing and internal colonization against Sri Lankan Tamils. Nor is it to deny that militant Tamil nationalism in Sri Lanka has largely been a response to the systematized and legislated discrimination of the Sri Lankan state. The LTTE is, in fact, a legitimate national resistance movement and was – until recently – the de facto governing entity in several parts of Sri Lanka. However, in its progress toward and current operation of that position, it too has often represented an ideology of ethno-religious chauvinism; has used undemocratic and authoritarian practices to crush resistant views and movements – including against dissident Tamils; and has used mass murder, ethnic cleansing and internal colonization against Muslims. The point here is not that the LTTE is just as bad as the government of Sri Lanka – which many Sri Lankans, Tamils and otherwise, think it is – but that a critical left view cannot support the LTTE, except tactically in opposition to the oppression of the Sri Lankan state. Nor can it support the LTTE’s ideology or practice. Thus, the assumption should not be made that support for Tamils in opposition to Sri Lankan state oppression is consonant with support for the LTTE. Meanwhile, at the rallies, protestors have on several occasions been literally caged into tight areas and police officers have often used excessive force on them. Protestors have been arrested merely for speaking out, and, at times, have been brutalized with no provocation (see BASICS Bulletin and rabbletv ). 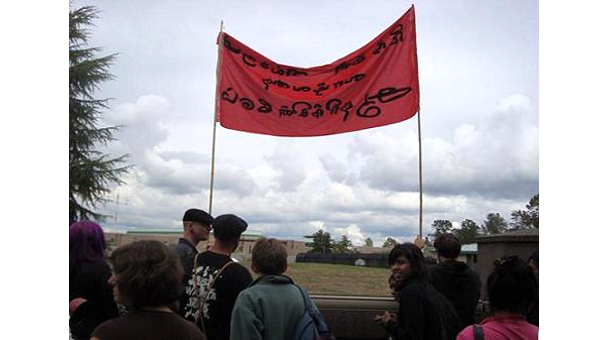 To that end, critical leftists in Canada should work toward facilitating the kinds of cross-ethnic solidarity movements and conversations that have been mostly foreclosed by the terroristic strategies employed in Sri Lanka by the armed forces and by the LTTE. While acknowledging and addressing the limitations of Canadian multicultural policies here, we need to capitalise on our distance from the conflict, and the relative peace afforded by that distance (however racialised and restricted it is), to facilitate dialogue. At the same time, the LTTE has used civilians as human shields and has engaged in forced conscription. It must therefore also be criticized and its particular human rights violations not excused or glossed over. The ideology of twenty-first century imperialism is manifest worldwide. In particular, in South Asia, the discourses of “wars on terror” in Afghanistan, Pakistan and India are smokescreens for governments and imperial actors like NATO and the United States to obscure real, legitimate and popular grievances by focusing instead on military campaigns. This is precisely the strategy currently being used by the state in Sri Lanka against its local Tamil grievances. Furthermore, the Sri Lankan state receives military aid from, among others, Pakistan and Israel – lackeys of American empire. China, too, in increasing its international political reach, has steadily provided arms and funding to Sri Lanka for several years. India has also played a major role through its intervention or absence of intervention, in line with its hegemonic designs in South Asia. Moreover, it should be noted that the governments of Russia, China, Iran, India, and many others are no better for the people of South Asia than traditional Western imperialists. The political elite of all these countries contributed heartily to the massacres of thousands of Tamil civilians in Sri Lanka. 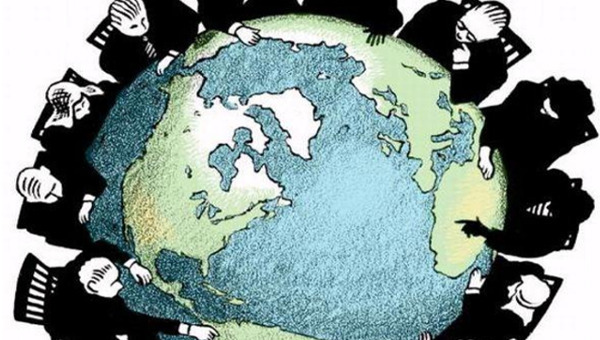 The international dimensions of the conflict are too complex to be examined in detail here, but we should engage in further study of the conflict’s global connections, because in resisting the violence of the Sri Lankan state, we are also taking a stance against certain operations of international imperialism. We must recognize, however, that ultimately the problem is one of Sinhala ethnic chauvinism and the lack of meaningful political representation of national minorities in Sri Lanka. Noaman G. Ali is an organizer and writer with BASICS Community News Service, where this article first appeared. Noaman is a PhD candidate in political science at the University of Toronto. Fathima Cader is a Colombo-born Tamil Muslim who spent five weeks in April and May 2009 in Sri Lanka. She is a law student at the University of British Columbia.